Second, old friends. I spent last weekend with three of the ladies I went to university with. We all did the same BSc course – Environmental Science – and next year will be the 30th anniversary of our graduation. We spent most of the weekend eating, drinking and talking – it was fab. It is made from a repurposed t-shirt, with the message appliqued in felt. Bags like this are, unsurprisingly, quite stretchy, so are not ideal for lugging pounds of spuds home from the greengrocers, but are great for lighter items, such as yarn, tea and biscuits! I am happy to send this anywhere in the world. If you would like to be entered into the draw to win it, simply comment below, or in the post on the Snail of Happiness Facebook page, or on Twitter (@thesnailofhappy), and tell me what you’d like to put in the bag if you win it. I will include any comments left before midnight on Tuesday 13 June (BST) in the draw. Many thanks to those who contributed – I hope you can spot your creations (they are all in there), which will now be going off to new homes. Although the emphasis was heavily on the performing arts this year, the Chorlton Arts Festival did include several other visual art exhibitions and we managed to visit two. Do you notice, that as well as the art, they also have a little free library out the front of the shop? So, life goes on in the city of Manchester, if with a heavy heart. I do hope that everyone out and about over the weekend had their lives brightened a little by the creativity that was on display, whether tattoos, beauty from recycled materials, craftivism, sculpture, our decorated community garden, or the lovely bees sent by Helen of Crawcraft’s Beasties, long before we realised how significant they were going to be. It was several months ago that Danielle and I started organising our contribution to the Chorlton Arts Festival – a window display and our ‘Kindness Tree’ event. The latter is happening on Saturday: a day of crafting to create objects with kind messages to give away to strangers. We will have a tree to decorate in the shop, plus we have permission to adorn the railings by the library with the little gifts and messages. Chorlton, in case you don’t know, is in Manchester. And now seems like a particularly good time to share some random acts of kindness in Manchester. If you are in the area, please do come and join us (details here), but if you are not in the area, I’d love to think you are with us in spirit. So, I have a request. Wherever you are in the world, on Saturday, please will you undertake at least one random act of kindness? It doesn’t need to be anything big – it could just be a smile at a stranger – but please will you do something? I know what a caring community we are all part of here in this little bit of the blogosphere, and I’d love to think of our ripples of kindness spreading across the world. Several people have asked over the past few days about what constitutes craftivism. Basically, it’s any crafted item that gets a message across – whether personal or political. Many people feel more comfortable with gentle ways to encourage change rather than being confrontational, and what better way to get your message across and gain attention than via a unique item rather than a letter? 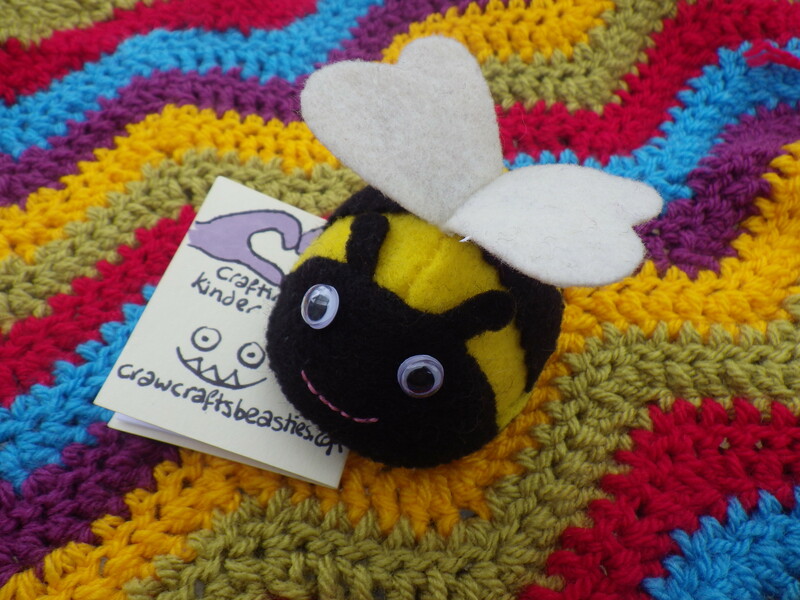 Send a felt bumblebee to your MP to make your point about conserving pollinators and they are certainly more likely to remember it than if you send them an e-mail. Do you have a message you’d like to share with the world? Perhaps you can make your voice heard more effectively than simply shouting. JULY 2017: This piece is now available for sale in my etsy shop. This month’s ScrapHappy make is a “no-sew” shopping bag that involved a lot of sewing. I mentioned this creation in my post about craftivism the other day, but it’s finished now and I’m quite pleased with it. If you fancy making a t-shirt bag, they take about 10 minutes to create if you don’t get carried away with the decorations. All you need is an old t-shirt – remember it’s going to have to hold stuff, so if it’s full of holes or nearly worn through it’s probably better to turn it into cleaning cloths. I must credit Joanne Harold for showing me how to make these bags – thanks Jo! I’ve been inspired to write this (and future) Scrap Happy posts by Kate, who provides links to other (mostly sewing) Scrap Happy bloggers at Tall Tales from Chiconia on the fifteenth of every month… do check them out. You can insert words or a picture using a computer program then send us the file, or you can print out the card, write or draw by hand and then scan or photograph it to send back to us. We will then print out your file and include it in the display. These bags are really easy to make (a quick internet search will provide plenty of tutorials to choose from) if you don’t decide to include a message! Contact me using the form below if you’d like to be part of our project. I’d love as many of you to contribute as possible. The theme that Danielle has chosen is Crafting a Kinder World. As well as the display, there will be a craftivism event on 27 May and I will be there to help host it. The plan (so far) is to create a “Kindness Tree”. We’ll spend the day inviting people to craft all sorts of small items to hang on the tree, each with a message of kindness. Subsequently our gifts and messages will be given away to spread the love. I’m currently putting together a few bits and pieces to contribute to the shop window display, but most of my craftivist creations are long gone – having been given away to those in need (either of the object made or the message it embodied). So, I need to make a few more… but you can help me out here if you like. 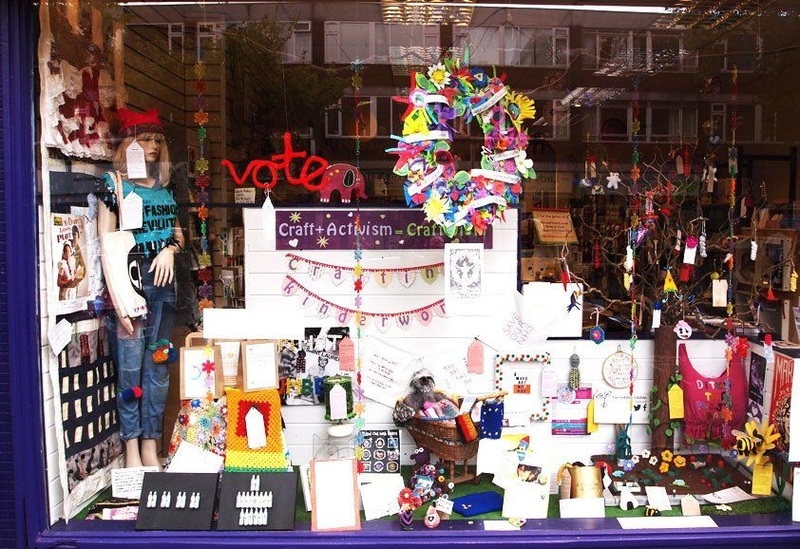 If you would like to send me an item to put in the window – whatever the craft, as long as it represents an aspect of craftivism – then please do. It could be a charity blanket, a twiddlemuff, a motivational embroidery, some bunting with a message, a piece of artwork, or whatever other crafted object fits in with the ethos. The display runs throughout May, so we would need your contributions in the next two weeks. There are two provisos. First, that the nature of the object is kind – craftivism is a gentle form of protest, or political action through positive creation – so any contributions that are displayed need to fit with this. And second is that, when the display is finished, you will allow me or Danielle to donate your object, whatever you send, to an appropriate charity or deserving person rather than send it back to you. You can keep up to date with what’s happening on the Make-it Shop website here. And you can contact me to arrange making a contribution using the contact form below. And if you are in Manchester on 27 May – call in and say hello, have a cuppa and make something with us. * Putting aside the fact that something is either infinite or not… I don’t think it’s possible to be ‘more infinite’! Knitting and crochet are often considered rather solitary pastimes – we sit at home with our hooks and needles, creating lovely things… alone. With the recent popularity of ‘knit and natter’-type groups, things have become somewhat more sociable. Public crafting, however, is still relatively rare, so it was a delight to have the chance to spend Saturday at The Make-it Shop in Manchester crocheting and publicising the 60 Million Trebles project. I made a weekend of it so that I could be there for the whole day and help my friend Danielle to host the event. The shop is a collection point for blankets for the project, so Saturday provided an opportunity for people to drop off completed work, plus we worked on our wips* and squares for a group blanket during the day. All this amazing creative work is being undertaken by kind people from all over the world who are covering all the costs and simultaneously raising money for various charities. Every blanket will be donated to a charity and we may even break a world record! If you’d like to join in, you can donate money via this Just Giving page or you can donate yarn or squares or make whole blankets… check out this Facebook group or this web page or @Sixtymilliontre on Twitter to make contact. It’s been gratifying to see craft taking centre stage in world politics over the past few days… did you see all those amazing hand-crafted hats on Saturday? Knitted, crocheted, sewn, and created from plastic bags (check out Alys’ hat here). Such diversity, such individuality – so common to see if you frequent blogs like this one, but so rare to have highlighted in the mainstream media, where the most common craft stories are ‘did you know that knitting is not just for crones?’ and ‘men invented knitting, so it’s ok for them to do it now’. Chez snail there are no pink hats – many other colours, but not pink – but the creativity is still being channelled towards social change/craftivism. Despite having treated myself to some lovely new wool on Saturday, my hook has only been employed on scrap yarn, creating more blankets for the 60 Million Trebles project (#onestitchonelife) aimed at helping refugees and highlighting the terrible situation of displaced people. I was trying to stick to one blanket at a time, but I’m quite happy to fail at that!